Donabate Golf Club is a 27 hole parkland course in North County Dublin just 12 minutes from Dublin Airport, that offers varying challenges on each nine created by a combination of water hazards, undulating greens and mature trees. All of the greens are sand based which makes them playable all year round. 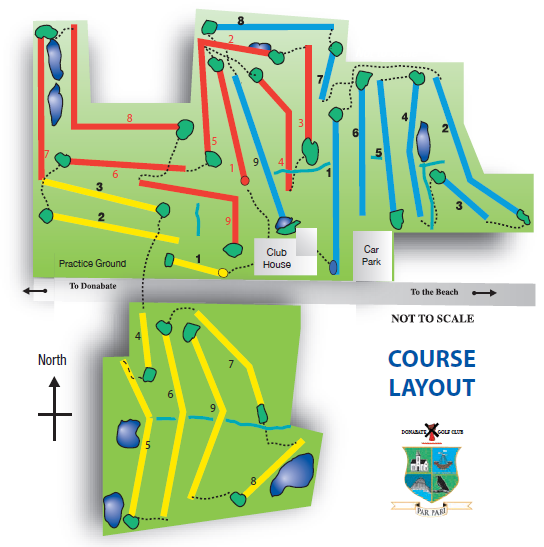 Donabate's three nine hole courses can be played in any combination which is an enjoyable and challenging course for golfers of all abilities and requires accuracy and good course management skills. Click on the icons below for detailed information on each of the three nines - Yellow, Red or Blue. Golfers can prepare for their round on the natural grass practice range. Also available is a chipping green, with 2 bunkers and several types of playing surfaces fairway, first cut, rough and a links type waste area. We also have a putting green to work the short game.